These are the two ATCs I stitched for the May exchange at the Cross Stitch ATC Facebook group. The first theme is “The Letter C” – the plan is that all 26 letters will be covered, but not in alphabetical order (just to keep us on our toes!). 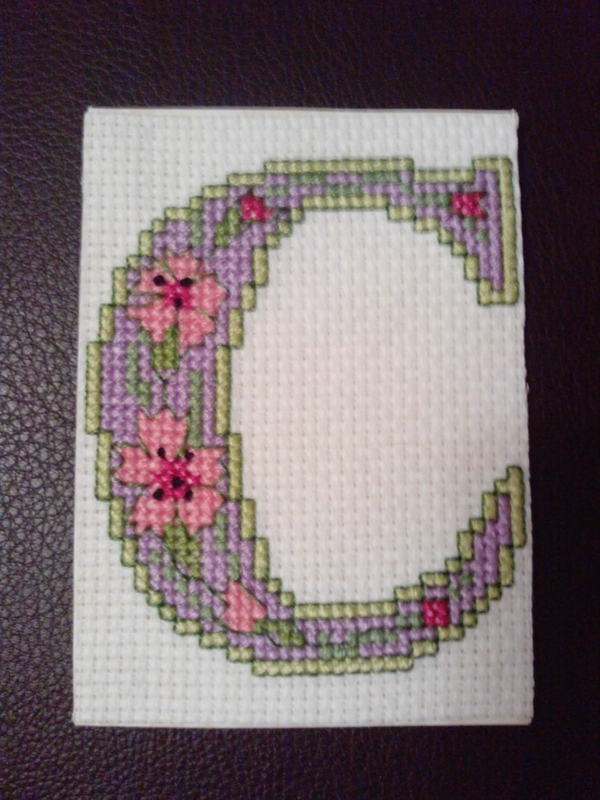 I chose my design from Illuminated Letters by Lesley Teare – the alphabet featured in an issue of The World of Cross Stitching (I don’t know which issue – I swapped a chart with a member on a forum to get these), and I plan to use these designs for my whole alphabet series. It’s stitched on white 14-count aida in various DMC threads and only just fits on the card, so next time I’ll be using a higher count of fabric! The second theme is “Oriental”. 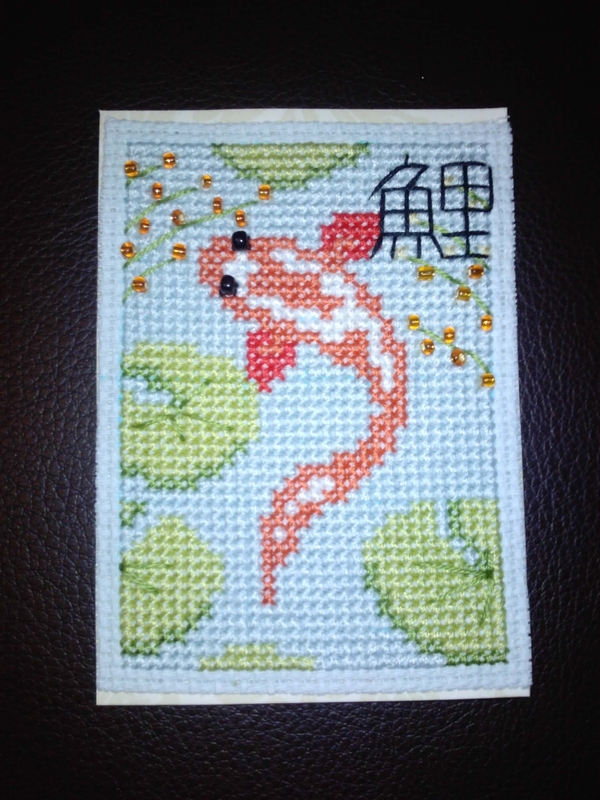 I found this gorgeous little koi design which is free to download from Cross Stitch Happy and just knew it was the one for me! I didn’t use the suggested colours, but instead picked colours out of my existing stash. I also replaced the eyes and most of the little buds on the plants with beads, just for a little extra dimension. Finally, I added the Japanese character for “koi” in the upper right-hand corner. The koi represents love and friendship, so this beautiful fish was the perfect choice for an exchange. I like him so much I almost wished I could have kept him for myself, so I think there’s a distinct possibility I’ll stitch him again for a card or some such thing. This version is stitched on pale blue 14-count aida in various DMC threads and beads I had to hand. This entry was posted in Crafts, Freebies, Pastimes and tagged Aida, alphabet, ATCs, Cross Stitching, DMC, Domestic Goddess, Exchanges, Freebie, illuminated letters, koi, Oriental. Bookmark the permalink. Your ATCs look wonderful. I love the added beads and character to the Koi, it really enhances the piece!